1. Congratulations! You have just opened your business. What is it about? The name of the shop is CurveS+ Fashion. You can catch the store in Facebook and Instagram. We have a physical shop in 28th Square, Dumaguete City. 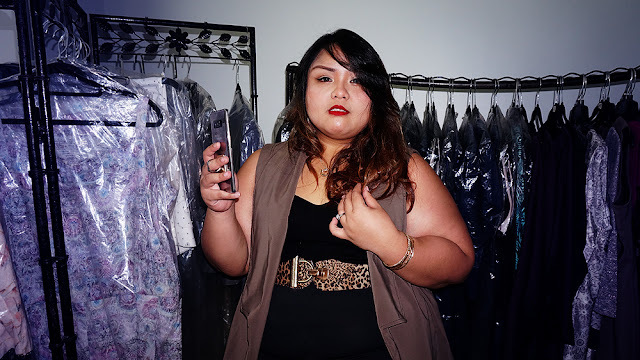 It is a shop that showcases different plus size clothes. It comes from different brands, both local and international. We have a physical store in 28th Square, Dumaguete City, but I do have same stocks in Manila thus, we opened it online and ship nationwide. This business is very close to my heart. I have been in the plus size fashion/modelling industry for 6 years now and I must say, have had access to different options when it comes to plus size fashion. Apparently, the growth has not expanded much yet in the provinces, especially in my hometown. This is the reason why I decided it would be a great venture to put up a plus size shop in Dumaguete. The very challenging part was how to start up. Like there were so many ideas in the table. All my classmates in that afternoon were very excited and shared all their ideas as well. Getting the funds needed, getting the right suppliers needed, and all that. We opened the shop online as well. When I returned back to Manila, I realized that there are also many buyers/customers here in Manila. So we decided to maintain stocks both in Dumaguete and Manila, which is really challenging to manage orders given the 2 locations. Just like in my modelling career, the rewarding part in this new business venture is when you get a thank you note or positive feedback from your customers. Seeing their smiles and seeing them being more confident with what they wear is all worth the effort. It’s also a great feeling that you are doing something which do not only help me financially but also other people. It is a win-win situation and I hope God will guide me to just keep it going. 4. You are also a current Erzullie Icon. Do you think this will affect your Iconship in a bad way? Why or why not? Yes I am, and I am happy to say that this is my 6th year already with the brand. I am so grateful with the trust that Erzullie has given me. Over the years, Erzullie has been very supportive with me in my different ventures because we live with the same advocacy. So with CurveS+ Fashion, I believe it will not affect negatively my role as an icon of the brand. In fact, given I am also collaborating with them to release Erzullie clothings in my shop, it actually opens opportunities for both of us in Dumaguete City. I make a timetable of what needs to be done and maintain a calendar of activities. I make sure I give ample time for each task as much as possible. It’s also good that I have people working with me in those areas, making sure that I am able to delegate when necessary when I need to prioritize on something. Of course, to keep my sanity intact, I make sure I balance it with giving my self-time off regularly. This re-energizes me and keeps me going. 5. How do you see your business in 5 years? Why so? Wow! 5 years from now. I do hope we can have a shop on our own! By that time, maybe we can expand our products and market, from plus size to opening it to regular sizes also. Then I will have more suppliers providing more items to the market through my shop. Then it will be like a specialty shop, wherein everything a woman needs is already there. I do hope God permits, we can have that expansion of CurveS+. 6. Messages to the Erzulliestas. Hello Erzulliestas! First of all, I’d like to say thank you for being the powerful and beautiful woman that you are. I also wish that you are able to do what your heart aspires to and never let anything or anyone hinder you from doing it. Yes, challenges and obstacles will be there, but it is just a test to check how much you really want something. Just focus on the goal and just look forward for the outcome. I wish you all the best and continue to spread positivity in your own simple ways. Keep the fierceness!